The independent panel said it had confidential information about those it believes to be responsible for the killings, including Israeli army snipers and commanders, and called on Israel to prosecute them. "The Israeli security forces killed and maimed Palestinian demonstrators who did not pose an imminent threat of death or serious injury to others when they were shot, nor were they directly participating in hostilities," it said. In a scathing response, Prime Minister Benjamin Netanyahu said Israel rejected the report "out of hand" and accused the UN Human Rights Council of hypocrisy and lies fuelled by "an obsessive hatred for Israel". Palestinian President Mahmoud Abbas said the findings confirmed "what we have always said, that Israel conducts war crimes against our people in Gaza and the West Bank, including in Jerusalem". "The International Criminal Court (ICC) should act immediately and open a probe into the crimes conducted (by Israel)," he said in a statement. Protests at the frontier between Israel and the Gaza Strip began in March last year, with Gazans calling on Israel to ease a blockade of the territory and for recognition of the right to return to lands their ancestors fled or were forced to flee when Israel was founded in 1948. Israel has said its forces opened fire to protect the frontier from incursions and attacks by armed militants. No Israeli soldier was killed at the protests, though four were injured, the panel said. The latest report, covering the period from March 30-December 31, 2018, to the UN Human Rights Council, was based on hundreds of interviews with victims and witnesses, as well as medical records, video and drone footage, and photographs. UN High Commissioner for Human Rights Michelle Bachelet should share the findings with the ICC, the investigators said in the report. Israel is not a member of the ICC and does not recognise its jurisdiction but the Hague-based court opened a preliminary investigation into allegations of Israeli human rights abuses on Palestinian territory in 2015. The Gaza Strip, a coastal enclave controlled by the Islamist group Hamas, is home to two million Palestinians. 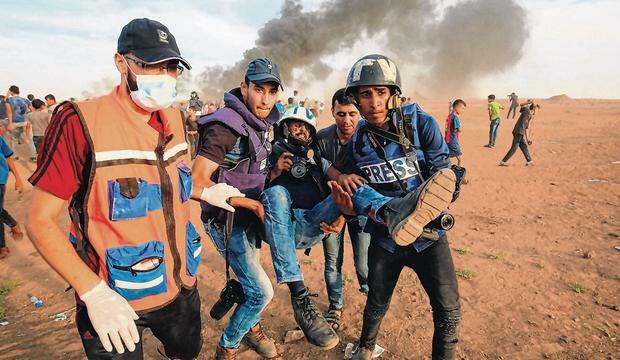 Thirty-five children, two journalists and three "clearly-marked" paramedics were among those killed by Israeli forces, in violation of international humanitarian law, the panel said. "We are saying that they have intentionally shot children," said panel member Sara Hossain.